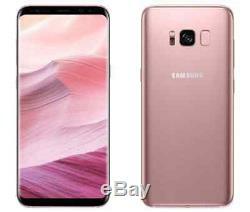 Samsung Galaxy S8 Dual SIM G950FD 64GB Gold/ Blue/ Black/Gray/Pink Unlocked. 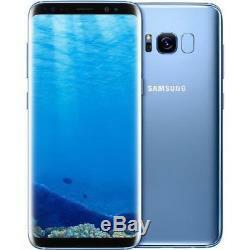 Samsung Galaxy S8 Dual SIM G950FD 64GB Maple Gold/ Coral Blue Unlocked. Super AMOLED capacitive touchscreen, 16M colors. 5.8 inches (83.6% screen-to-body ratio). 1440 x 2960 pixels (570 ppi pixel density). Dual SIM (Nano-SIM, dual stand-by). 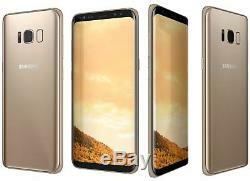 Exynos 8895 Octa - EMEA. MicroSD, up to 256 GB (shares sim2 slot). 64 GB, 4 GB RAM. 12 MP, f/1.7, 26mm, phase detection autofocus, OIS, LED flash. 1/2.5 sensor size, 1.4 µm pixel size, geo-tagging, simultaneous 4K video and 9MP image recording, touch focus, face/smile detection, Auto HDR, panorama. Wi-Fi 802.11 a/b/g/n/ac, dual-band, Wi-Fi Direct, hotspot. 5.0, A2DP, LE, aptX. 148.9 x 68.1 x 8 mm (5.86 x 2.68 x 0.31 in). 155 g (5.47 oz). Non-removable Li-Ion 3000 mAh battery. GSM 850 / 900 / 1800 / 1900 - SIM 1 & SIM 2 (dual-SIM model only). HSDPA 850 / 900 / 1700(AWS) / 1900 / 2100. LTE band B1(2100), B2(1900), B3(1800), B4(AWS), B5(850), B7(2600), B8(900), B12(700), B13(700), B17(700), B18(800), B19(800), B20(800), B25(1900), B26(800), B28(700), B32(1500), B66(AWS-3), B38(2600), B39(1900), B40(2300), B41(2500). These phones are factory unlocked and come with all original accessories in original box. These phones come with International Charger. Our phones do not work with CDMA carriers like Verizon, Sprint, Boost, or any other CDMA Network Carrier. If an item has been opened and/or used, a. Address cannot be changed at any time. We have the right to cancel the order under the following circumstances. In case of a Pricing Error. The buyers duty to the government. E have the right to cancel the order under the following circumstances. · In case of a Pricing Error. Our Brand new phones come with all original accessories in original box. Our international model phones comes with International (European) Charger. Our phones usually do not work with CDMA carriers like Verizon, Sprint, Boost, or any other CDMA Network Carrier unless mentioned in the listing. We do not guarantee, imply or express warranties unless otherwise stated in the listing. This policy may be modified or changed without any further notice. NEW ARRIVALS NOW AVAILABLE AT DISCOUNTED PRICES. We are your one stop solution for all your telecom business needs. Please add me to your list of favorite sellers and visit often. Thank you for your business. 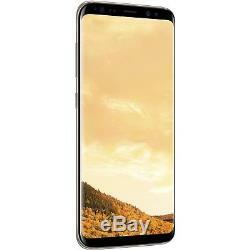 Le-offers="Samsung Galaxy S9 SM-G9600 - 64GB - Titanium Gray/ Midnight Black (Unlocked)">. 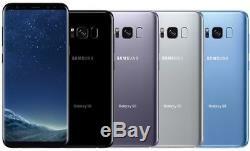 · We list all brand new/replacement devices under. · Exchanges may only be made within 30 days of receiving the merchandise for Graded stock only. · If an item has been opened and/or used, a. · If your order arrives incorrect or the package was damaged in transit, you must notify us within 2 days of receipt. Your return will be rejected if there are any iCloud/ Samsung/ Google account OR passcodes/ screen pattern locks. Defective items will be replaced only after matching the serial number with the one in our system. · Damage caused by liquid damage. · Damage caused by dropping the product or intentional mistreatment. · Damage caused by attempting to repair by yourself or a third party. 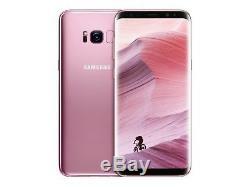 The item "Samsung Galaxy S8 Dual SIM G950FD 64GB Gold/ Blue/ Black/Gray/Pink Unlocked" is in sale since Monday, July 23, 2018. This item is in the category "Cell Phones & Accessories\Cell Phones & Smartphones". The seller is "cellntell" and is located in Mississauga, ON. This item can be shipped to Canada.